Many kids love to play with dolls, and this type of play can not and should not be characterized for just one gender. 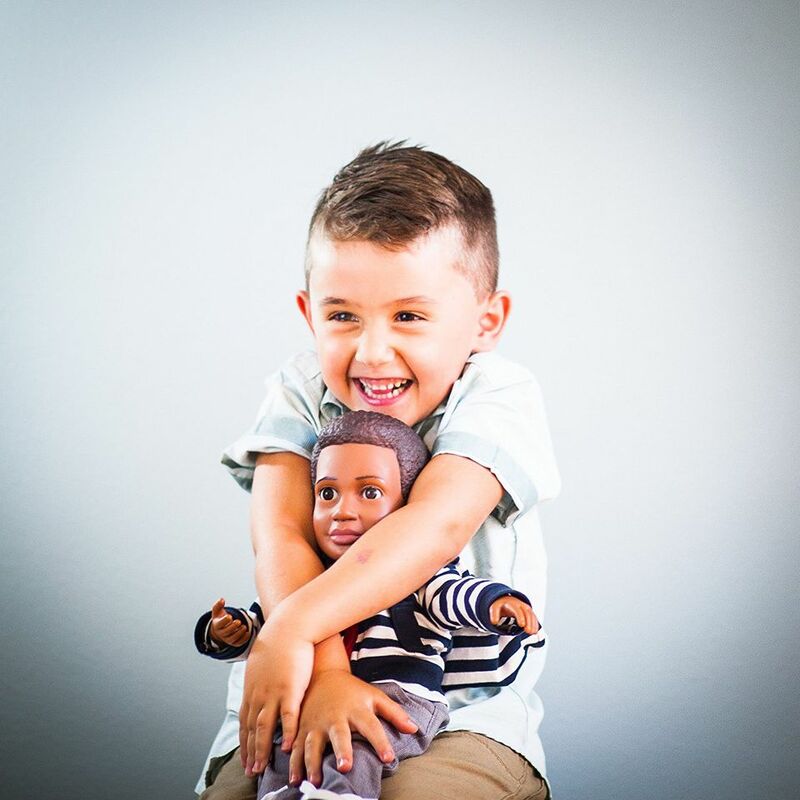 Every child is different and they might play with their dolls a little differently, so having many boy doll options available can help parents and gift givers chose the best companion for their child's interests and individuality. American Girl Dolls are popular, 18-inch fashion dolls that typically girls love to collect and accessorize. Each doll arrives with a book to read and has a unique story. Logan Everett is the first American Girl boy doll. Logan Everett, a drum player, was released at the same time as Tenney Grant. The duo is singer/songwriter musicians from Nashville, TN. Whether you have a daughter looking to expand her collection with a boy companion, or a son who wants a doll to play with on his own or with a sibling, the Logan doll brings collectability and popularity to the boy doll aisle for American Girl doll brand fans. Meet James, Will, Erik and Marco, the WonderCrew Buddies! The WonderCrew are 15-inch best friends that kids can take anywhere. They arrive wearing a superhero outfit, a cape, and a mask. There is even a superhero cape for the child to wear, too. There are different themed adventure kits for the buddies, that include construction outfits, pajamas, and safari clothing. Each adventure pack includes an accessory for the child to use or wear, like a safari hat, or bedtime blanket. The buddies are available in 4 different ethnicities. Created by a therapist, the Crew helps promote and empower boys to use their imagination, develop confidence and promote emotional intelligence. Boy Story dolls are 18-inch dolls, available in 2 options, Billy and Mason. Each doll has a different ethnic background. The dolls are ready for action and include 11 different ball and socket joints that can be posed for play in many ways. Due to their design, the child can help the doll pretend to do anything they like to do, such as play a musical instrument or kick a soccer ball. The boys are also featured in storybooks, too. Adora dolls are collectible dolls that children are able to play with. These dolls have very unique and special features that most other dolls do not, such as hand-painted faces, hand-applied eyelashes. Their clothing is sweet yet fashionable. The dolls have on-trend accessories and clothing that is hand-sewn. These dolls are larger than most, at 20 inches in height. Their weighted bodies make them feel heavy, just as if the child was holding a real baby doll. Cabbage Patch Kids are fun retro toys many parents enjoyed as a child themselves during the 1980's. The company is a trendsetter in the boy doll aisle, having designed fun boy dolls for decades. These soft body plush dolls are easy to carry, but include modern day interests, like skateboarding and even being a baseball fan. The dolls have clothing that is easy to remove and change. Looking for realistic baby dolls, with different ethnic features? JC Toys dolls have varying facial features and arrive in different sizes with storybooks accessories. Some dolls are wearing a reusable diaper, hospital bracelet, and even have gauze near their belly button. can be purchased with Asian, African American, and Hispanic features and skin tones. The My Life As A... doll line features girls doing real every day things like going to school, participating in sports, having community jobs, and caring for animals. There is 1 boy doll in the line, the School Boy. The doll is 18 inches and has brushable hair. The School Boy is available in 2 different skin tones. This doll is exclusive to Walmart. Corolle has unique baby dolls that can even help children learn to potty train! Aside from being a great baby doll to dress, feed and take care of, each doll has anatomically correct parts. Kids can feed their doll water from a bottle, then push the belly to watch it urinate. While this might sound gross, it really is an interactive way for some children who learn by doing, to figure out just how eliminating on the potty works, making potty training times more successful. Parker is a boy doll made exclusively for Pottery Barn by Gotz, a German collectible doll company. The Parker doll is an 18.5-inch doll, who is wearing a sporty letterman's jacket. Parker's hair can be combed, and limbs are able to be posed. Kids love to play in water with their dolls, especially in the pool and bathtub. The Corolle baby boy bath toy is specially designed for water, allowing it drip dry when bath time is over. The doll is able to be used in many different environments such as soapy water, chlorinated water from a pool, and salt water.